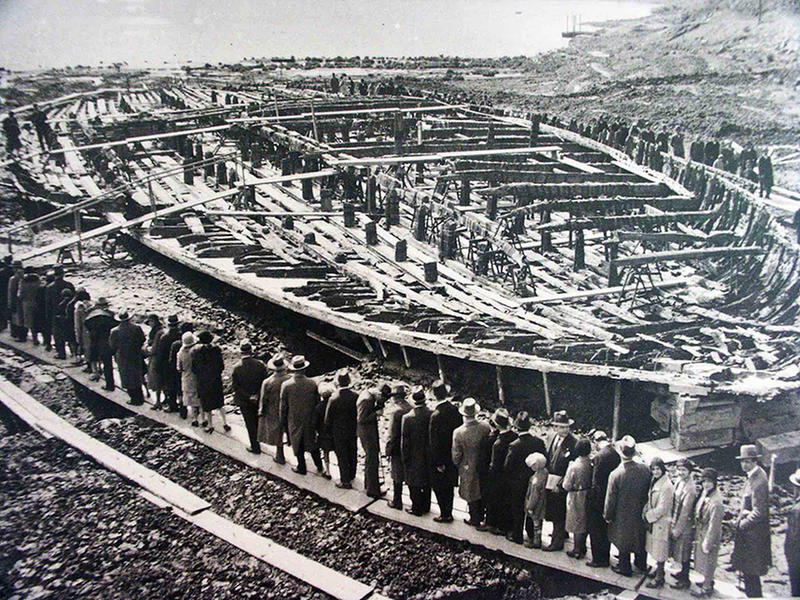 As one of his capricious whims, Emperor Caligula ordered several large barges to be built to use on Lake Nemi. 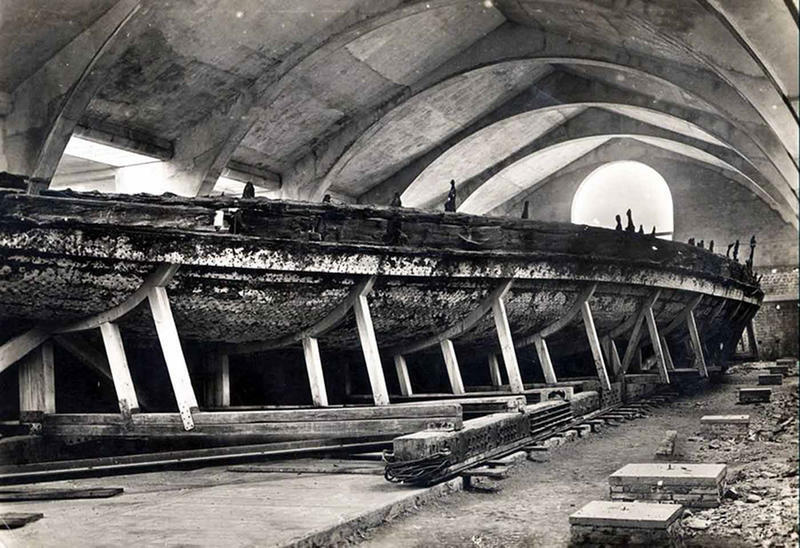 The two vessels, which were designated in modern times as Prima Nave and Seconda Nave, (First Ship and Second Ship), had dimensions of 70m x 20m and 73m x 24m respectively. Ther intended purpose and eventual use of the two vessels has long been the subject of debate by scholars and historians. Some contend that Caligula built the barges to show the rulers of Syracuse, Sicily, and the Ptolemaic rulers in Egypt that Rome could match any luxurious pleasure barges that they built. Other scholars argue that Caligula designed one of his ships as a floating temple to Diana and some say that the other ship may have been used as a floating palace for orgies, murder, cruelty, music, and sport. The flat-bottomed Nemi vessels were not self-propelled. Instead, they were attached to the shore by chains and bridges stretching across the water so people and commerce could travel back and forth. According to some historical accounts, Caligula’s ships were the scenes of orgies, murder, cruelty, music, and sport. One of the most fascinating aspects of the whole affair was the fact that knowledge of the two huge vessels being in the lake had never been lost throughout the ages, from the reign of Caligula, to the twentieth century. Local fishermen had always been aware of the existence of the wrecks, and had explored them and removed small artifacts, often using grappling hooks to pull up pieces, which they sold to tourists. In 1446, Cardinal Prospero Colonna and Leon Battista Alberti followed up on the stories regarding the remains and discovered them lying at a depth of 18.3 meters (60ft), which at that time was too deep for effective salvage. The attempts resulted in degradation of the wrecks and plundering of artifacts. By 1827, interest had revived to recover Caligula’s ships. 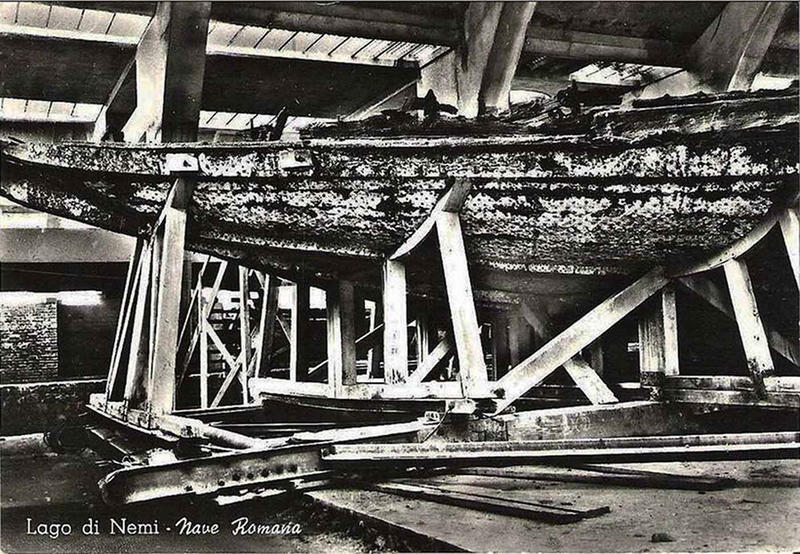 Annesio Fusconi built a floating platform from which to raise the wrecks however, several of his cables broke so he called a halt until he could find stronger cables. When he returned, he found that the locals had dismantled his platform to make wine barrels leading to him abandoning the project. 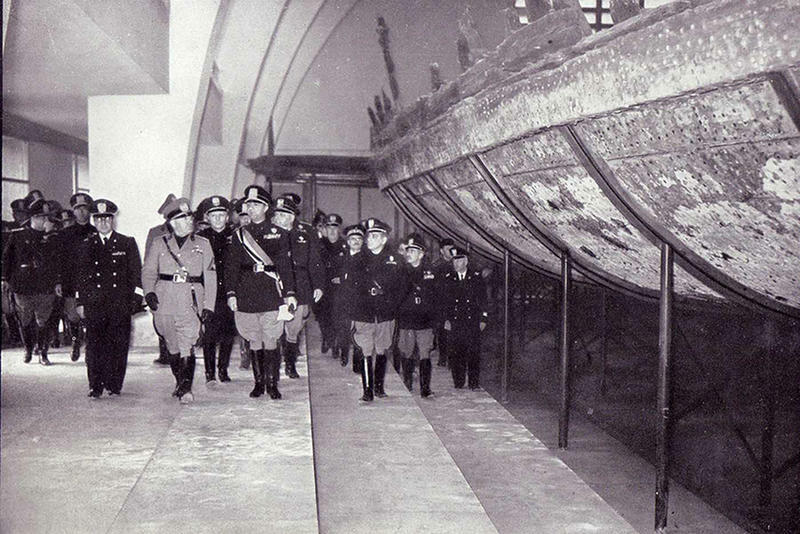 The Fascist government of Benito Mussolini worked to recover Caligula’s ships for about five years – from October 1928 to October 1932. Mussolini ordered to drain Lake Nemi. The local people and archaeologists knew of an ancient Roman underground tunnel that connected the lake to farms outside the crater and they connected it to a floating pumping platform. Using powerful pumps and water scooping machines, the workers lowered the level of the lake and by June 10, 1931, they had recovered the first ship and the second had been exposed. The devastation caused by previous attempts at lifting was all too apparent from the time the ship became visible. Practically all of the original upper-works had been torn off and what remained lay in a jumble inside the hull with a multitude of other artifacts. 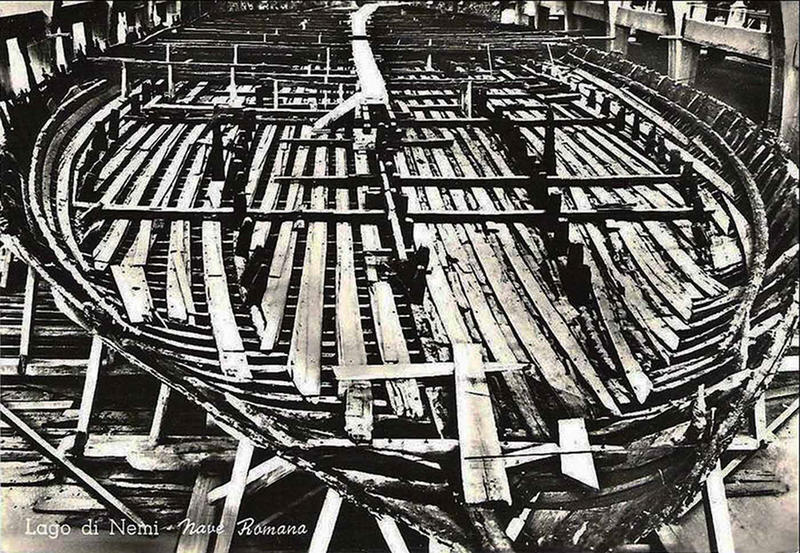 The discovery proved that the Romans were capable of building large ships. Before the recovery of the Nemi ships, scholars often ridiculed the idea that the Romans were capable of building a ship as big as some ancient sources reported the Roman grain carriers were. The ships were destroyed by fire in World War II on the night of May 31, 1944. Several US army shells hit the Lake Nemi Museum around 8 pm, causing little damage but forcing the German artillery to leave the area. Then a few hours later, smoke arose from the Museum and soon the two ships were burnt to ashes although the museum’s concrete structure suffered little damage. The Lake Nemi Museum was restored and reopened in 1953. Photographs, drawings from the Italian Navy survey, and drawings of archaeologist G. Gatti also survived the fire, allowing artists and architects to make reconstructions of the two ships. The spaces that once held the two immense Nemi Ships are now filled by one-fifth scale models built in the naval dockyard near Naples, and bronzes and other artifacts that survived the fire. Outside the Lake Nemi Museum, a life-size reconstruction of the sailing ship’s hull is displayed.